I seem to remember Ronald Reagan voted against a national holiday for King. It is now celebrated every year while Reagan the darling of the right is remembered as the president who transferred more wealth to the rich than any president in history. The movie SELMA has just arrived in theatres with a powerful reminder.In the words of the old Protestant hymn,no cross, no crown.The film of course is about the historic 1965 civil rights march from Selma, Alabama to Montgomery.Though the USA president Johnson had signed the Civil Rights act the year before, the blacks in Selma, half the electorate were only 2% on the electoral rolls. The cracker way of life did not cede so easily. Johnson still had to be pushed.The film makes this point. well. Always the supreme cynical politician Johnson always had one eye on elections. The civil rights movement ridiculed his gradualism and forced him to act. Similarly with Selma — he held back as long as he thought the protests didn’t threaten his political future while his action would, and when it became clear he had no choice, he acted.It was the ordinary people who marched, sat in and demanded action who forced his hand. LBJ was right,standing with the blacks cost Democrats the southern cracker states. No cross, no crown. Those were the halcyon days in the Catholic church before the set decorator priests claimed control.SELMa was worth seeing, a great reminder of an activist age. It was worth seeing again those nuns and priests walking with De Lawd to Freedom Land. Out of the sanctuary and into the streets. 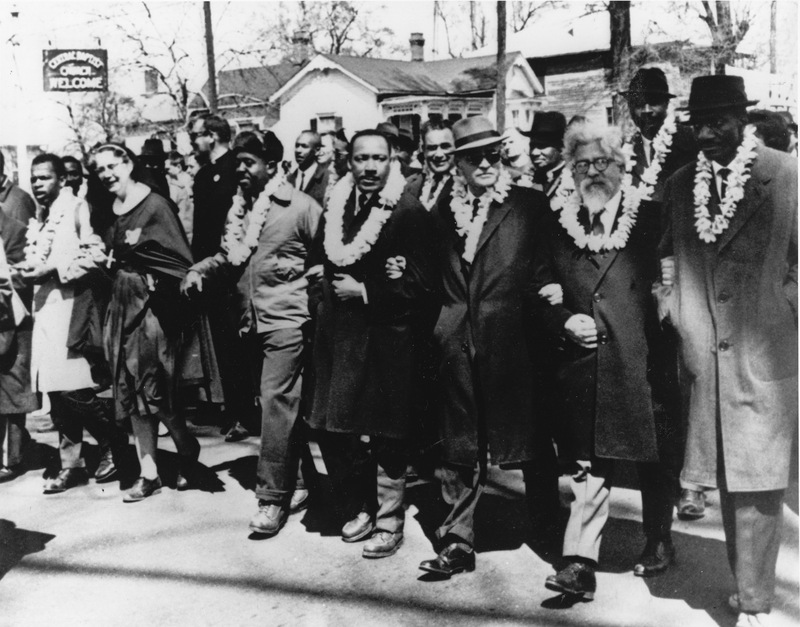 As one of the great marchers pictured with Doc King above Abraham Heschel reminded us,”Prayer is no substitute for action.